March 18, 2010 - Two Navy Boeing F/A-18E Super Hornet jets were involved in a mid-air collision at approximately 10 p.m. on March 15th while on a routine training mission flying in the Fallon Range Training Complex. Neither pilot was injured. The Fallon Range Training Complex (FRTC), located in the high desert of northern Nevada approximately 65 miles east of Reno, NV, is a set of well defined geographic areas encompassing a land area and multiple air spaces. It is used primarily for training operations, with some capability to support research and development, and test and evaluation of military hardware, personnel, tactics, munitions, explosives, and electronic combat. Both aircraft are assigned to Strike Fighter Squadron One Three Seven (VFA 137) based at Naval Air Station Lemoore, California. One pilot safely landed his aircraft with reported damage at 10:13 p.m. at Naval Air Station (NAS) Fallon. The other aircraft crashed in a remote area east of NAS Fallon. The pilot ejected safely and was recovered near the crash site at 11:20 p.m. by the NAS Fallon "Longhorns" Search and Rescue team, which flew a SH-60F Seahawk helicopter to the site. The pilot was transported to a local medical facility for further evaluation and has since been released. The cause of the mishap is under investigation. 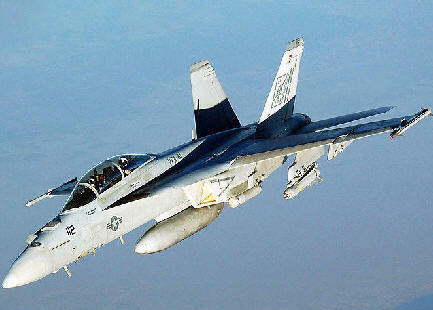 The Boeing F/A-18E Super Hornet is a 4.5+ generation carrier-based multirole fighter aircraft. The F/A-18E single-seat variant and F/A-18F tandem-seat variant is larger and more advanced derivatives of the F/A-18C and D Hornet. The Super Hornet has an internal 20 mm gun and can carry air-to-air missiles and air-to-surface weapons. Additional fuel can be carried with up to five external fuel tanks and the aircraft can be configured as an airborne tanker by adding an external air refueling system. Designed and initially produced by McDonnell Douglas, the Super Hornet first flew in 1995. Full-rate production began in September 1997, after the merger of McDonnell Douglas and Boeing the previous month. The Super Hornet entered service with the United States Navy in 1999, replacing the F-14 Tomcat since 2006, and serves alongside the original Hornet.